LEXINGTON, Ky. (Oct. 18, 2018) – Across campus, students and alumni are celebrating Homecoming with parades and tailgates leading up to the game against Vanderbilt on Saturday. 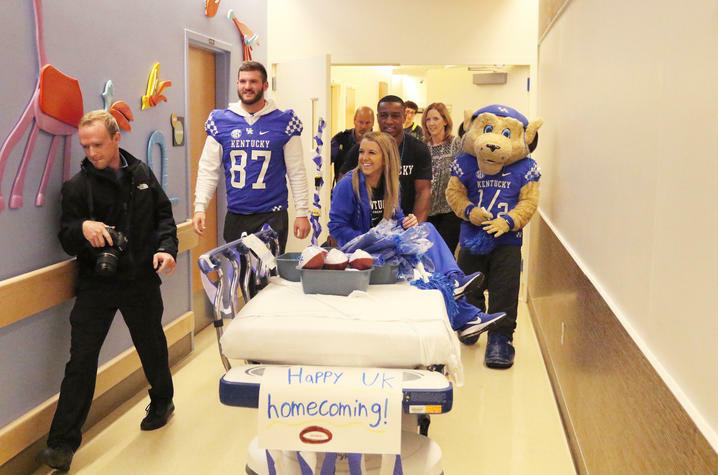 No doubt members of the football team are gearing up for the big day, but tight end CJ Conrad is celebrating in a different way; he's bringing the homecoming festivities to the patients of Kentucky Children's Hospital. 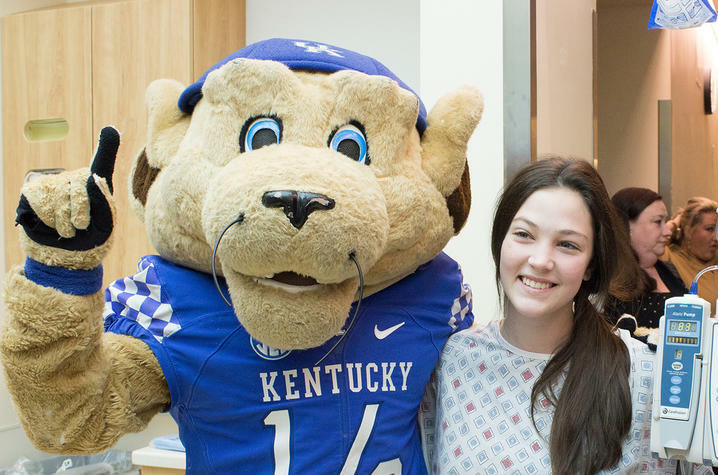 Every Tuesday, CJ visits Kentucky Children's Hospital, bringing a little of the UK spirit to those who need it most. He visits patients in their rooms, makes crafts with them in the playroom and poses for pictures with them and their families. But on the Tuesday before the big homecoming game, CJ enlisted the help of some friends. "We did something special this week for homecoming. We had some cheerleaders and a mascot, and we decorated a stretcher to look like a parade float. We went down the halls passing out footballs, beads and pompoms. The kids light up when they see the mascot. It was a fun day." Inspired by his former teammate and roommate Courtney Love, who had a passion for mentoring children, especially those in one-parent households, CJ wanted to put his downtime to good use. "I give a lot of credit to Courtney Love. I saw what he was doing in the community, and I wanted to use my platform to give back. He passed the torch to me, and I hope I can pass that to another guy on the team. 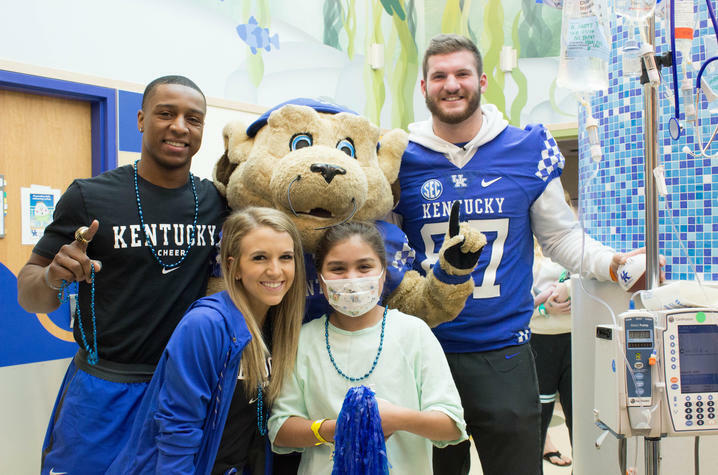 "My brothers are going to be so jealous," said 12-year-old patient Adriana after posing for pictures with CJ, UK cheerleaders Riley Aguiar and Josh Marsh and Scratch, the mascot of UK's Junior Wildcat Club. CJ learned that the patients not only watch the games, but they have some opinions on the team's strategy. "They ask me 'why don't you get the ball more?,'" CJ said. CJ will continue to visit KCH every Tuesday until he graduates in December. Eventually, he wants to start his own foundation to help children. "I love kids, and I love putting smiles on kids' faces. It means a lot. It's been an amazing experience. To see these kids, going through what they're going through, a tough day in my life is not nearly as hard as they got it right now."